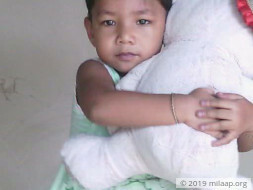 “My little baby, Anisa had just learnt to speak. I was excited about every new word she picked. I believed that her words can take away all my sorrows. But now, instead of encouraging her to speak, I'm forced to keep her calm. Even speaking for a few minutes makes my baby breathless and blue. Everytime she struggles to breath I fear that I might lose her forever,” Yasmin, Anisa’s mother. 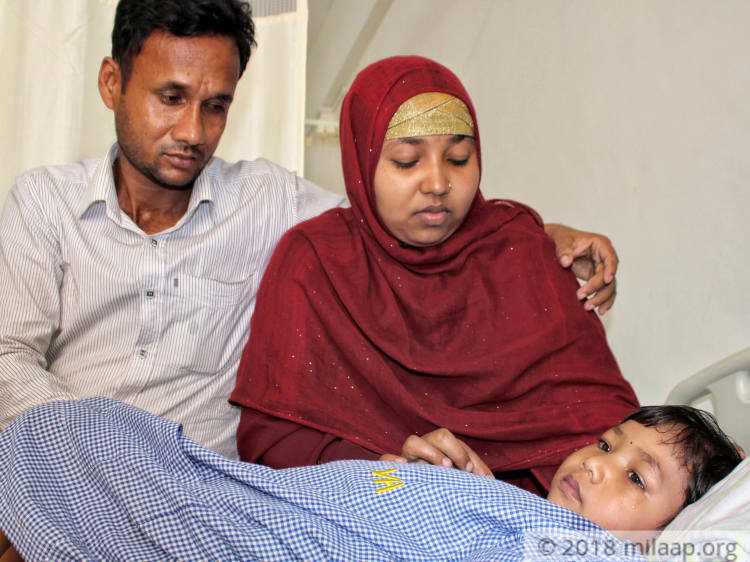 4-year-old Anisa keeps asking her parents why she has to go to the hospital every now and then. She promises her mother never to do any mischief again. Yasmin fails to make her toddler understand that it is not her fault. She doesn’t understand how to tell Anisa that she has a severe heart condition. Little Anisa suffers from Tetralogy of Fallot, a severe heart condition in which the oxygen-rich and oxygen-poor blood gets mixed. Anisa seemed a healthy baby, until her 2 years and then suddenly, she began falling short of breath. The small family of 3, were very happy in their own small world. Arman thought he earned enough to give his family the basic necessities. 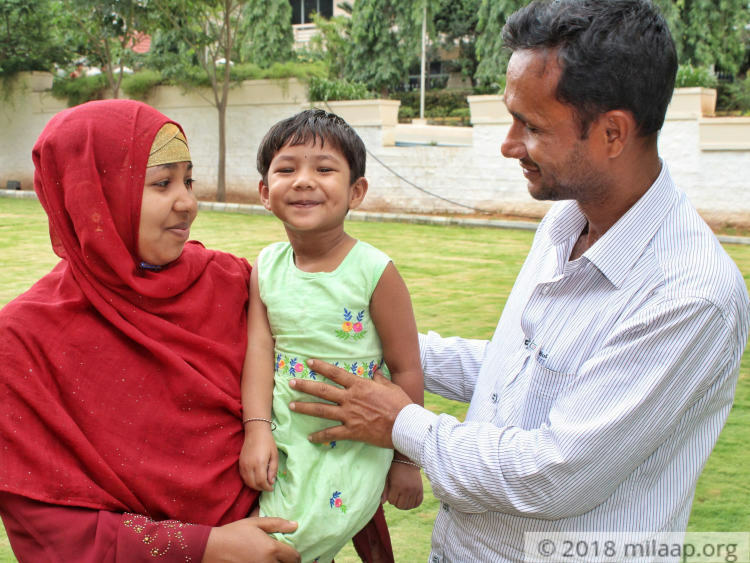 After Anisa’s birth, he took up two jobs to give his daughter a better life. Beside cultivating crops, he also drives auto. Even that is no longer enough to save Anisa. Arman has been driving auto for 12-15 hours after Anisa’s diagnosis. For a year now, Arman has barely slept. Yasmin stays awake in the fear that her baby might struggles to breathe at any moment. 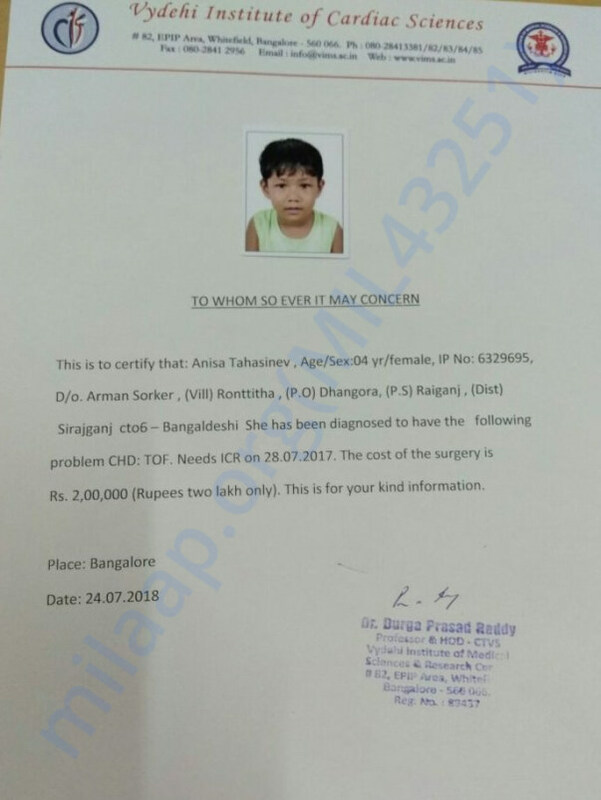 4-year-old Anisa is suffering from a severe heart condition and she needs a heart surgery to stay alive. Overtime work and borrowing are no longer enough to save the little girl. The cost required to save their only daughter is Rs 2 lakhs and they have nothing left with them. Your support can help the child walk and run again. Thank you so much for the support you have shown towards Anisa and her family so far. Baby Anisa is in ICR and her condition is becoming critical.She is having some breathing problem but is under 24 hour care at the hospital and is being treated for the same. Her parents are struggling to pay the bills and need our support. Request you to please share this campaign link with your friends and family as much as possible. Appreciate all the support. Get well soon girl. Our sincerest prayers are with you. All the best and blessings to the child. May Allah cure her, Aameen ! God bless you little angel!